North Carolina is renowned for its golf courses…and we’re talking about the mini variety, too! 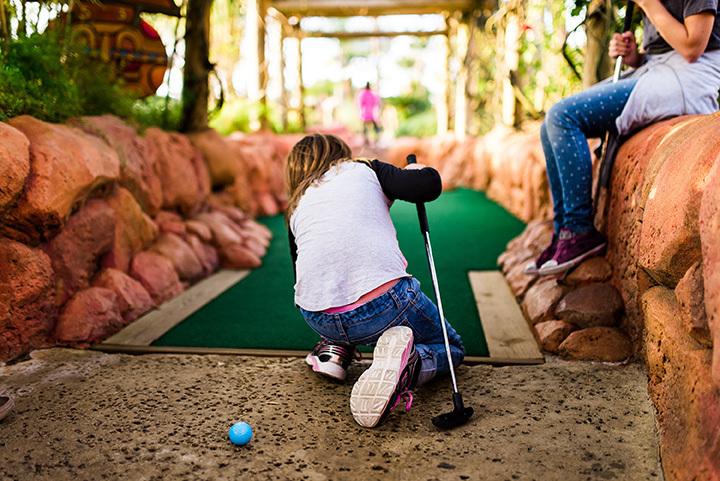 Perfect for a family outing, the mini golf courses of North Carolina feature everything from pirate décor to arcade games to sno-cones! Here are the 10 best in the state. Lake Norman Mini Golf is a family run business created to help families like their own spend more time together. Head over with your family to enjoy a variety of activities that go beyond mini golf. Be aware that the place shuts down in winter to give the family time to enjoy the snowy mountains of North Carolina. Adventure Landing has many locations, but the Gastonia tends to be popular with both locals and people from near and far looking for fun things to do. With three different mini golf courses, an arcade, batting cages and themed snack bars, there is plenty to keep groups occupied for an all-day adventure. Tucked into Gastonia’s Eastridge Mall, Lunar Golf is a fun twist on the classic. Because it’s indoors, you can play in any weather, but the real fun are the glowing blacklights that highlight the course. Look for Groupon offers or bring a large group for a discount off your admission. Queens Landing is an entertainment and activity center unlike any other. One of the most popular attractions is the mini golf course. For only $6 ($4 for kids) you get unlimited access to the course, which covers waterfalls, caves, a sandcastle and more. There are also decadent eats and more fun to be had off the course. Mutiny Bay Adventure Golf is a strongly pirate themed mini golf course. Paying tribute to the Carolina’s history of piracy off the coast, Mutiny Bay includes canyons, boats, lookouts and other fun things. There’s also a pirate themed arcade and a gift shop to bring home ye treasure from the day. Located right across from the beach, you can get in a round or two before or after you enjoy a day of sand and surf. The affordable mini golf has two different outer space themed courses where you can encounter aliens, volcanoes and even your fellow terrestrials. Lost Treasure Golf’s Kill Devil Hills location will have you hunting for lost treasure as you make your way through the elaborately themed golf course. If you plan your adventure accordingly, you’ll first right a mining train to the first hold and then follow your guide through the rest of the course. Frankie’s Fun Park is full theme park with different things to do, from playing virtual reality to riding rides and scarfing down junk food. One of the more affordable ways to spend a day is by playing mini golf, surrounded by tropical plants and waterfalls. A family owned business, Tropical Gardens Mini Golf has been entertaining Asheville with wholesome family fun for nearly 30 years. The tropical theme extends over two courses and includes wild animals and volcanoes. There also batting cages, sno-cones and more elements for a great party or day of family bonding. Located along the riverbanks, Chimney Rock Adventure Golf provides a naturally idyllic setting for a laidback round of putt putt. Listen to the sounds of the river as you play some challenging mini golf and fuel up with sno-cones and ice cream from the snack shack.